SANTA CLARA, CA – Elvis Aaron Presley, better known as “The King of Rock’n’Roll,” was considered the most significant American Icon in the 20th Century. The King is no longer with us, but there is still a way for people to experience what Elvis did during his concerts. One of them is to watch TRAVIS LeDOYT’s “A TRIBUTE TO THE KING” show. Described by the press as “The world’s best young Elvis, ” TRAVIS LeDOYT looks like Elvis, sings like Elvis, dances like Elvis, and his mannerisms are strikingly so similar to those of Elvis, that he makes those who see him performing on the stage, do a double take. It is not surprising that like Elvis, LeDOYT sells out every one of his concerts.“A TRIBUTE TO THE KING,” however, is considered by LeDOYT as his “tribute” to Elvis, not as his impersonation. “Technically, I would be an impersonator, because that’s what I am doing,” tells TRAVIS to CULTURAL WORLD BILINGUAL, “But I prefer to get away from the word, impersonator, because it conjures into people’s minds a negative meaning. They know that it is hard for anybody impersonating somebody else to be authentic, so when they hear the word, they are not longer sure about a show simply because they do not like impersonators. Maybe they don’t like them because they saw, previously, another show by an impersonator that was no good and, because of their past bad experience, they believe now that any show done by an impersonator is going to be corny, ” He pauses. “To those people who think that way, I would like to ask them to give my show a chance, they will enjoy it. It is a great family show . The music is great and it reaches all ages." His one-night show will be presented by SCU Presents organization, an Arts for Social Justice program of the College of Arts and Sciences, in Santa Clara University on Friday, October 11 at their Theatre which is located on their campus. C.W.B. You probably never saw Elvis because you are too young. Why did you get interested in him? T.L. “when I was growing up,” my mother was always playing music from the 50’s in the radio so I was exposed to his music all my life but I never paid much attention to it. When I was about 16, I saw a Documentary Analysis of Elvis Presley in the fifties that showed him performing, and I was captivated by that. C.W.B. Were you captivated by his voice or by his dancing? C.W.B. Have you had any music lessons before? C.W.B. What is music for you now? C.W.B. Why made you want to perform as Elvis? C.W.B. 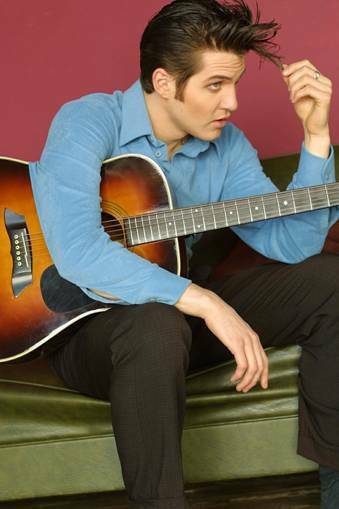 When was the very first time that you played as Elvis? C.W.B. What is for you the hardest part of playing Elvis? C.W.B. How do you feel to be performing in Santa Clara University SU Presents? The proceeds from TRAVIS' cocert will help fund the The Arts and Social Justice program of SANTA CLARA UNIVERSITY a program that believes that the arts touch each of us every day of our lives. Whether it is a song on the radio, a movie, a book, a painting, a dance or a play. They move us, educate us and have an impact on each of us, and it is our responsibility to use the arts to focus on the human condition and to shed light on the inequities of the world. Whether it is poverty, abuse, homelessness, human trafficking, gender and racial parity, or sustainability, we must use the arts to express ourselves, call attention to current issues and motivate individuals to promote change. The program, engages SCU students in these human issues bridging the gap between life at SCU and life out in the community.